Color and Design LP | Hawk Research Laboratories, LLC. 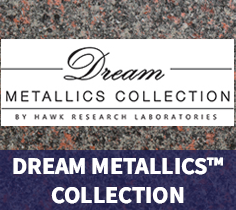 Dream Metallics™ Collection provides an elegant finish to StoneFlecks™ Ultra color designs. This unique Dream Metallics Collection comes in six beautiful modern colors; Burnished Gold, Antique Silver, Frost Pearl, Mocha Bronze, Ebony Black and Radiant Copper and can be permanently sprayed over any of our StoneFlecks Ultra multicolors on surfaces like countertops, backsplash, tile, accent walls, floors and other surfaces. Change the gloss level of your topcoat system using Hawk Flattening Agent by adding it directly to the resin before mixing the catalyst and the reducer. 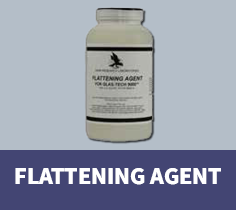 The use of a power mixer or drill mixer attachment is recommended when using flattening agent to ensure that the product is evenly dispersed throughout the resin. 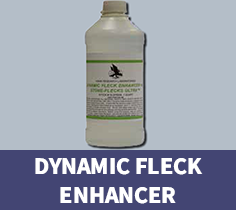 Dynamic Fleck Enhancer (DFE) is a proprietary blend of compounds which provides a more natural presentation of the StoneFlecks Ultra coating system. When properly used, DFE will enlarge the multicolor particle sizes, which resembles the look of natural granite and marble. StoneFlecks Ultra with DFE can be used with a smaller spray gun needle and nozzle, which can save time on equipment changes. DFE can also be used to reduce the viscosity of many water-based multicolor coatings and contains a drying agent to help reduce wait time between coats compared to using distilled water. Hawk Research Laboratories offers a color dispersion set which is unique and practical. These color dispersions are made with the finest, lightfast pigments and are fully compatible with all Hawk Research Laboratories’ topcoat systems. 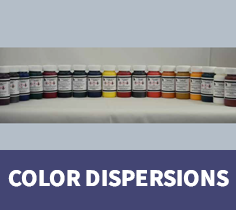 The super fine dispersions, compared to emulsifying agents, prevent the kick-out of certain colors that are common in some lower quality dispersions. The ability to cross-link assures proper catalysis with paints that contain even high pigment loads, without changing mix ratios. With the increasing demand of custom colors, Hawk Research Laboratories understands the importance of color matching while maintaining the high level of quality on these combinations. However, there are instances where a custom color can only be matched at the jobsite. GlasTech 9000 color tints can easily be mixed together or with a base color to deliver expert color matching capabilities for today’s highly mobile refinishes. 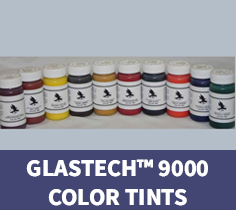 We formulate our GlasTech 9000 color tints by following strict quality standards in order to create virtually any color desired while on the jobsite, without worrying about overloading dispersions. Lower concentration colorants allow more accurate adjustments in mix ratios.